McALLEN — Hidalgo County Precinct 4 commissioner candidates made a final pitch to sway voters at a forum here Thursday. 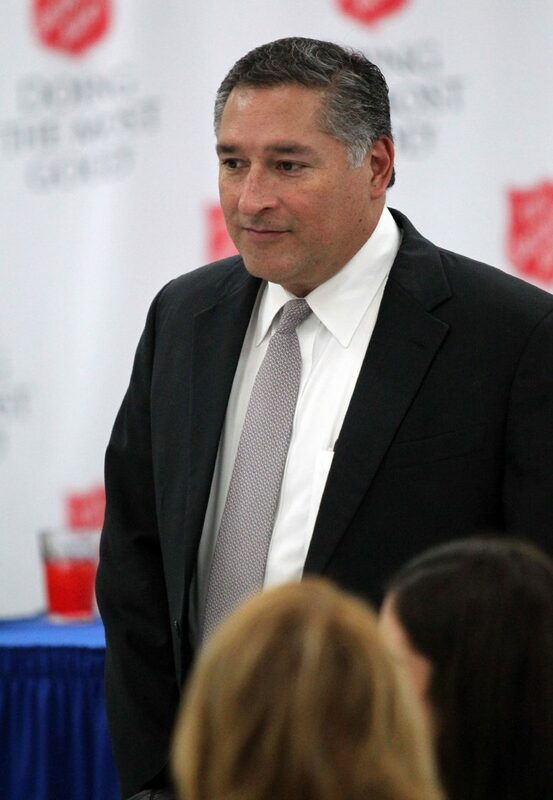 The McAllen Citizens League hosted the event at the Salvation Army in McAllen, where about 40 people gathered to hear from incumbent Joseph Palacios and challenger Ellie Torres. Attendees also listened to Javier Villalobos make his case for the McAllen District 1 commission seat. Tim Wilkins, who is in a runoff election for the position, did not attend the event. Torres and Palacios took time away from campaigning at the polls during the early voting period to participate in the forum. 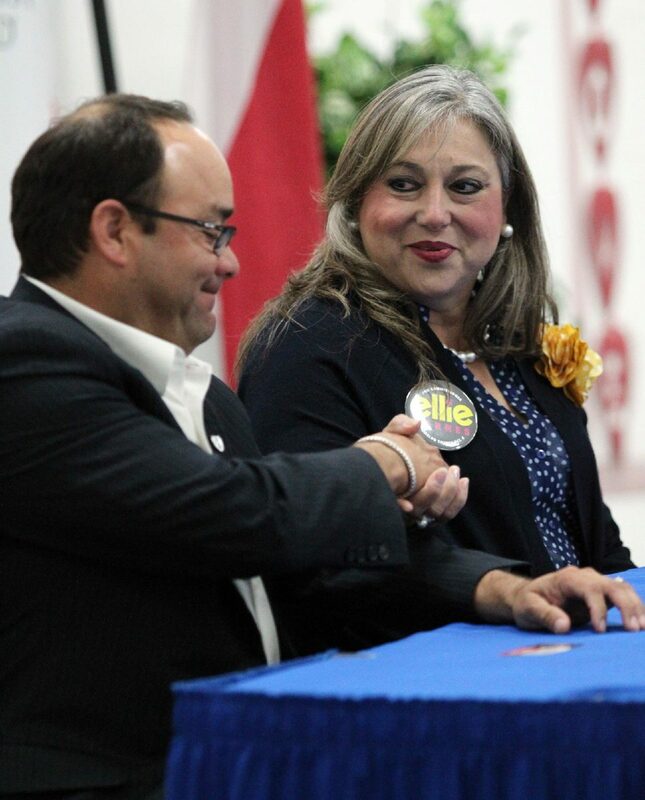 Hidalgo County Precinct 4 Commissioner Joseph Palacios and challenger Ellie Torres are seen during the McAllen Citizens League forum at the Salvation Army on Thursday Feb. 23, 2018, in McAllen. 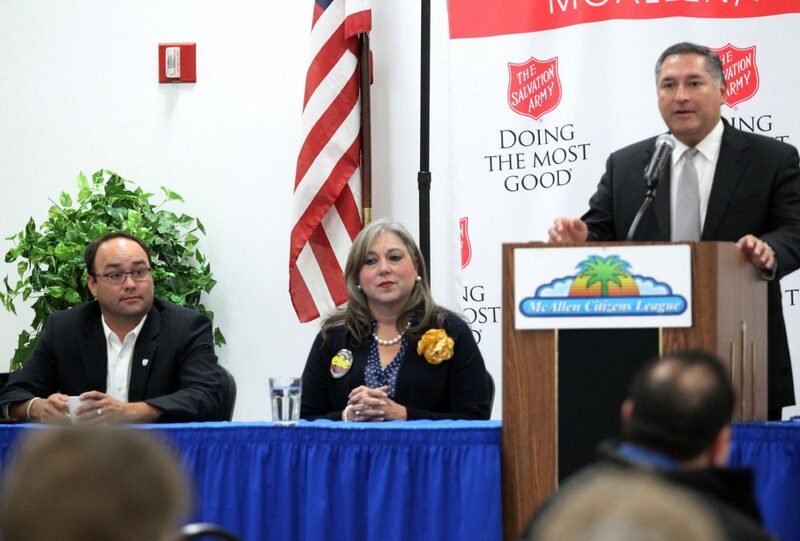 McAllen District 1 commissioner candidate Javier Villalobos speaks during the McAllen Citizens League forum at the Salvation Army on Thursday, Feb. 23, 2018, in McAllen. And much like at other similar events, the construction of the new courthouse continued to be a hot topic. The issue is particularly interesting because Torres’ husband, David Torres, is the mayor pro tem for Edinburg, and the council there does not appear completely convinced the city should contribute $30 million to the construction of the facility, as previously agreed upon. “Are you happy with the trajectory?” local radio host Davis Rankin asked of the project. “I’m very comfortable where we are with the courthouse,” Palacios replied. He also reminded the audience that the city of Edinburg has yet to forge a formal agreement with the county. Torres said she remained concerned about the project. She said she received concerned calls about the county’s decision earlier this week to negotiate with the sole bidder for the construction manager at risk position, instead of rebidding. “To me, it is still a concern, as it was for many people whose phone calls I got,” Torres said. The candidates also discussed institutionalizing the step and grade program for county employees, and addressed the constant changes to the budget that stem from not having one in place. Torres, an Edinburg school trustee, said of having such a policy in place, “it’s right for morale,” and touted the district’s approach to wage increases. Palacios said he led the effort to implement the program at the county and indicated it would be in place in the coming weeks. Rankin, who read the questions members of the league submitted prior to the event, also asked how they would better serve veterans in the county. Palacios, who served in Desert Storm and Bosnia, touted his service in the military and the opening of the new Hidalgo County Veterans Office, which celebrated its grand opening earlier Thursday morning. “We are going to continue to expand our services. This is a venue much bigger than we’ve had before,” he said, reiterating the services provided there are free of charge. Torres, who also attended the ribbon-cutting ceremony, also suggested increasing accessibility and services. “Quite honestly, I don’t think we do enough for them,” she said. Rankin’s last question touched on what he described as an underlying theme in recent elections to overthrow the Palacios family, a local political powerhouse. “Are we swapping one group of leaders for another group of leaders?” he asked. An unapologetic Palacios said he was proud of his father and his family for coming “out of the farms … out of the fields” to become educated and help lead the community. He thanked them for “paving the way” for him and others. He also indicated his desire to run for office was sparked when he began working for public officials. “It hit me when I worked in government and I saw the errors of elected officials,” he said. Palacios ended the event with a jab at Torres’ bail bond company, calling it a conflict of interest because commissioners oversee and manage the budgets for all courts.